This guide is written to aid a true level 1 newbie who has just entered ZombieMUD for the first time in learning the initial steps to a successful Zombie experience. It is recommended that you read the Newbie Guide before you proceed. To connect to ZombieMUD, you can use our web-based client. If you prefer to use your own client (recommended), see ways to connect. Before choosing Ranger as your guild, you must first select a race. Suitable races for a newbie Ranger include, but are not limited to: Centaur (can not see in the dark), Dwarf, Cromagnon (can not see in the dark) or Lizardman. Be sure to click the links to check out all the plusses and minuses of each race before choosing. Note that if you dislike your choice, as a newbie you can reincarnate (i.e. start over) with no loss of experience without having to create a new character. Type 'choose <race name>' to choose your race. When you have chosen a race, type 'continue' to proceed. Now you must choose your guild. 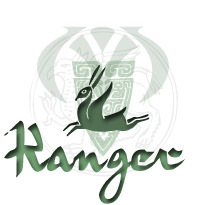 Type 'choose ranger'. When you log in, you will begin at the Church of All Gods inside ZombieCity. The first thing you should do is to visit Buju. He spends his days waiting patiently one east of the Church, and has much to offer you during your travels. Type 'east' or just 'e' and he will give you a gift. Good commands to try in his presence are: 'look at stone', 'say help', 'say transport', 'say portal' Also type 'map' to see the ZombieCity map and your current location. The next thing you need to do is gain a few levels with the free experience you have been given. You must advance in two places for each level you gain. You must go to the Adventurers' Guild and type advance to raise your 'adventurer level'. You can do this by going one east, one south from Buju, and typing '6 advance'. Next you much continue to the Ranger guild and advance your guild levels. Go back to Buju (one north, one west) and have him transport you to the guild by typing 'transport guild'. Once you are there, type '6 advance' and you are now a level 7 ranger. Buju will continue to transport you to your guild until you reach level 45. He will also you you the teleport stone, which you can use to get back to him should you get lost, until you reach 15M total experience, so make sure you visit him every boot. Now that you have a few levels, it's time to advance your knowledge in skills and spells. If you've followed the information so far, you should be standing in the Ranger Guild, if	not then go there now. To see what abilities are available to you, try the following commands: 'info 5', 'list skills', 'list spells'. As a newbie ranger, you primary offensive skill is 'kick', in which you have a small 20% bonus to start with. Skills and spells are trained at 5% increments. Now train your kick skill from 20% to 30% by typing '2 train kick'. Now also train the skill 'attack' and 'beast speech' to 10%. Also train the spell 'summon wild cat' to 20% by typing '4 study summon wild cat'. This spell is used to summon your ranger pet that will help you in combat. The skill 'beast speech' is used to talk with your pet. Note that depending on your race, you might not be able to train the skills and spells just this high due to racial limits, or you might not have enough money. But do not worry. It's time to go kill some monsters (and earn some money doing it). Time to go test your skills in combat. Use the teleport stone you have to get back to buju by typing 'summon'. Once back at Buju, you can enter the Newbie killing fields by typing 'portal'. At the portal, there is a machine that will provide you with basic equipment, type 'read plate' to see what it says and grab the equipment. After this, type 'equip' to start using them. Type 'enter' to enter the killing fields. Within these rooms should be a few very simple monsters such as frogs and small polar bears. Wander around a bit and get your bearings so that you can be ready to run if things go wrong. To prepare yourself for combat, type 'sc on'. This will report your health and spell points during battle. You can also type 'sc' at any time to see them. Set your 'wimpy' to 30 or any other number you feel comfortable with. Lastly, set looting on automaticly by typing 'set autoloot on'. You may change 'mewl' to any name you desire, as this will become the name of your pet cat. Be patient, this spell is slow. You may wish to grab a cup of coffee. It will now follow you and aid you in battle. Be sure to keep it happy by petting and well fed by typing: 'use beast speech at eat corpse' when you have a fresh kill on the ground. A battle will now begin. To continue using your skill, simply type 'use kick' without a target. This ensures that you will not begin battle with the next monster in the room. Hopefully all goes well and your poor frog is now living in mud heaven. You will now want to give it a proper burial. To do this, type 'dg' (or 'use beast speech at eat corpse') Type 'score' or 'exp' to see how much you have gained. Scamper around in this area killing critters untill you have gathered a nice sum of experience and cash, then head back to the Ranger guild to up your skill percents. Also in Rangers, you have the opportunity to begin working on true Masteries, an aspect of the guild which is permanent to your character. Each time you play a ranger Ranger, your mastery will still be there to make your character stronger. Go to the guild hall and type 'path help' and choose your own path wisely. Once you find the Newbie killing fields too easy, take a look at other newbie areas.